Kodak AV-126-TR Pageant Sound 16mm Movie Projector Parts Manual Discounts Apply ! Excellent quality photocopy of the original 1962 Eastman Kodak Company Parts List No. 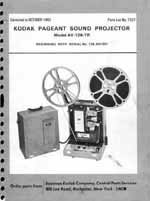 7527 for the 16mm Kodak Pageant Sound Projector, Model AV-126-TR. This 32 page manual is printed on double sided 8-1/2" x 11" heavy weight paper with two double size fold outs just like the original. It has a card stock cover and is plastic comb bound so it will lay flat on the workbench. The heavily illustrated parts manual contains complete parts and electrical component views and parts lists.